ComPakt - Tanks for Tight Spaces | ModuTank Inc.
ComPakt tanks are engineered for permanent or standby liquid storage in tight spaces indoors or outdoors.The ComPakt is available in capacities from 450 gallons to more than 15,000 gallons. Based on 4’0” high by 3’9” wide modules, ComPakts can be configured in square, rectangular or special shapes (see Custom Tanks). Their modular steel components are easily hand–carried by one or two workman through doorways and other small openings for quick bolt-together assembly. Compakts are supplied with one-piece fitted liners. A wide range of flexible membrane liners is available as well as double liners for secondary containment. ComPakt tanks easily accept through-the-wall flange fittings in factory cut holes or over-the-top piping. 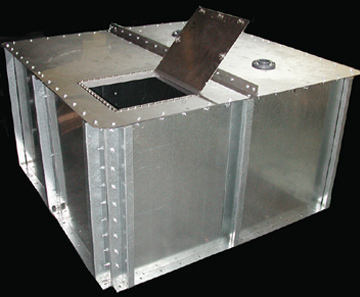 Bottom drains, flanges, leak detectors, baffles, sight tubes and hatches are available. ComPakt tanks can be fitted with stainless or galvanized steel covers, as well as tarp type and floating covers where total sealing of the tank is necessary. Wall panels are 16 ga. mill galvanized steel. Posts are 10 ga. galv steel with stainless steel tension cables. Liners are polypropylene, polyethylene or XR-5. Other liner materials are available.